Here’s the cover for The Girls with Games of Blood, the sequel to Blood Groove. Leave a comment before May 7 for a chance to win one of five signed paperbacks of Blood Groove, my first novel about vampires in Memphis in the Seventies. 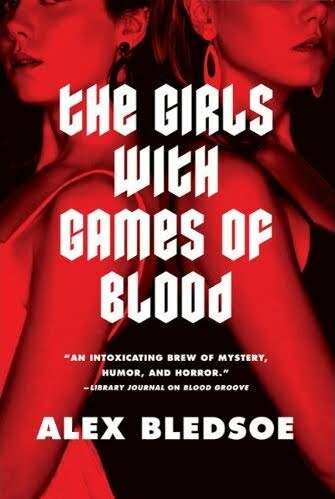 The Girls with Games of Blood will be available in July! Nice cover, goes well with the first one so you will be able to tell it's a series. The girls look very young, but at my age (did I just say that?) they all look young! I think it is good to use the same cover style within a series. So far I've read your great Eddie LaCrosse novels. Red and black covers catch my eye when browsing for new books. Hmmm, the clothes inside my closet are red and black. Co-ink-a-dink? Love the cover. And the idea for Blood Groove is so creative. I really like the cover, it matches the one from the first book. I doubt I'll win, but hey, worth a shot right? And the audio version of BLOOD GROOVE was fantastic. Can't wait! That tiny bit of eyeball I can see in the top right makes the character look very, very young. While I am a great fan of Blesdoe's work and have no doubts that the book will be great – the cover is really poor, and is very lazy on the publisher's part IMO. Love your Eddie LaCrosse books so I wouldn't mind winning a copy of Blood Groove. I dig the cover. Like the rest said, it keeps with the style of the previous book, but isn't close enough to muddle a distinction. Looks great – Blood Grove sounds really interesting. Great contest!